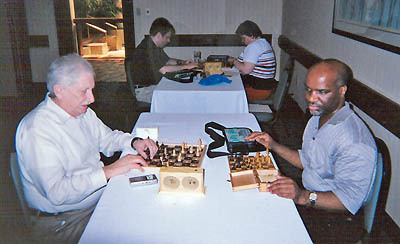 Alan Dicey vs. Michael Davis at the 2004 U.S. Blind Championship. Davis won the game enroute to a 4-0 performance and his first championship. Michael Davis of New York won the 2004 U.S. Blind Championship among six players scoring a perfect 4-0. The tournament was held in conjunction with the U.S. Open and held on August 8th-9th in Fort Lauderdale, Florida. Davis has played blind competitions for at least a decade, winning several class prizes. Last year, Davis would win his first championship by winning all of his games decisively and now becomes part of chess history trivia.